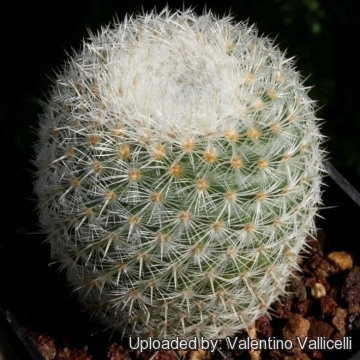 Accepted Scientific Name: Mammillaria supertexta Mart. Altitude: 400-2200 metres above sea level. Habitat and Ecology: The species occurs in tropical deciduous forests, Pinus-Juniperus forests and xerophyllous scrub, often hanging from limestone cliffs together with Mammillaria carnea, Mammillaria sphacelata, Neobuxbaumia tetetzo, Pachycereus hollianus, Myrtillocactus geometrizans, Myrtillocactus geometrizans var. grandiareolatus, Ferocactus robustus, Ferocactus recurvus, and Hechtia lapostolii. This species is listed as Endangered and in continuing decline due to expanding cattle and farming activities. The species is generally uncommon but densities are variable and range from 150 individuals/hectare to 6,000 individuals/hectare. Hort. Reg. Monac. (1829) 128, nomen; et ex Pfeiff. Enum. Diagn. Cact. 25. 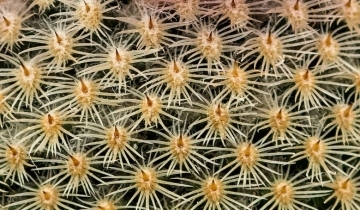 Mammillaria supertexta var. leucostoma Backeb. 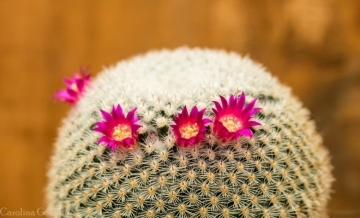 Description: Mammillaria supertexta is a clump forming cactus with small purple flowers in a ring around the sides of the stem. Its body is densely covered by crowded tubercles bearing short spines and abundant wool in their axils. Habit: Simple at first, later branching basally and from the sides to form clumps. Stem: Obovate to globose, green, 10-13 cm tall, 8-10 cm in diameter somewhat umbilicate at apex. Tubercles: Small, 2-4 mm long, ovate to conical, crowded, not lactiferous. Axils very woolly, so that the tubercles are almost completely covered. Radial spines: 16-18, slender, stiff, bristle-like, chalky white, spreading lower ones longest, to 5 mm. Flowers: Small, lateral (rather than near apex) pale to deep purplish red. Fruits: Clavate bright red to crimson. They are 8 to 16 mm long and 3 to 5 mm thick. Seeds: Brown. 6) Arias, S. & Zavala-Hurtado, A. 2013. 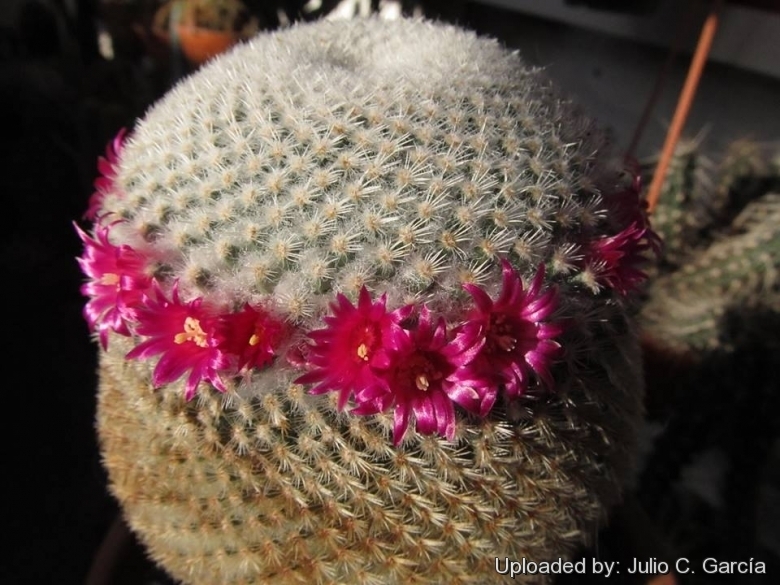 Mammillaria supertexta. In: IUCN 2013. IUCN Red List of Threatened Species. Version 2013.2. <www.iucnredlist.org>. Downloaded on 27 November 2013. Cultivation and Propagation: It is a free-flowering and relatively easy plant to grow. Exposition: Full sun to light shade. Watering: Water regularly in summer but do not over-water. Keep dry in winter. Hardy down to -4°C. 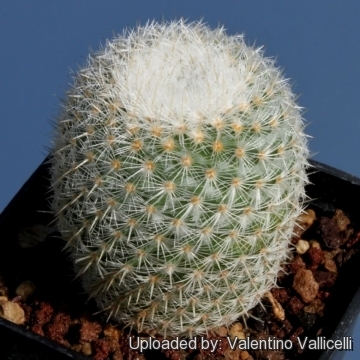 Growing tips: It is better that they be repotted regularly. Repotting will increase the number and size of stems, and will increase the number of flowers produced. Repot yearly until it reaches about 3 cm in size, then every two or three years will suffice. Repotting is best done at the end of winter, but it can be done at other time, too. Do not water for a couple of weeks after repotting, in order to reduce risk of root rot via broken roots. Propagation: Seeds or offsets if available.